If you haven’t heard of the Victorian freethinker and rights campaigner Charles Bradlaugh, it’s probably because the establishment have done their best to write him out of history. Bradlaugh was an atheist at a time when atheists were expected to stand silently aside and let the church get on with the business of dictating what people could and couldn’t do. Not that things have changed so very much. But staying silent in the face of injustice wasn’t Bradlaugh’s way. Elected to parliament in 1880, but prevented from taking his seat because he refused to swear an oath, Bradlaugh campaigned for rights such as freedom of belief, the right to peaceful protest, the rights of workers, and the right to information about, and to practice, birth control. He supported self determination for India. And in 1866, he founded the National Secular Society, an organisation which is still thriving, and of which I’m proud to be a member. 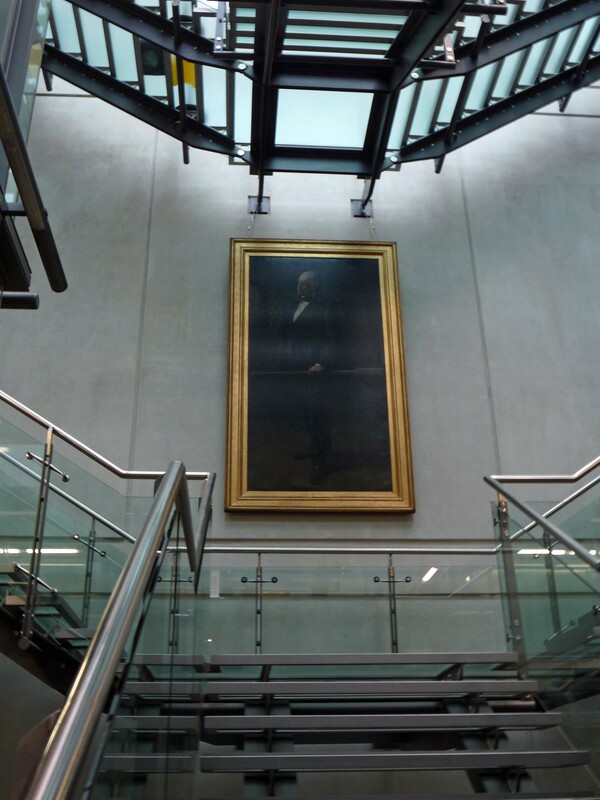 And last Saturday I travelled up to Manchester to attend an event; the inaugural Charles Bradlaugh lecture, organised by the National Secular Society (NSS) as part of their 150th anniversary celebrations. Despite being a member for some years, this was the first NSS event I had attended. Most are held in or around their London home in Holborn, and I haven’t been able to get down there. But when I discovered they were holding an event in my former home and favourite city, I just had to make a special trip. The venue was the Manchester Art Gallery, home to a magnificent collection of Victorian art (as well as earlier and later works) in a city that was at the heart of the struggle for justice, rights, and fair wages and conditions for ordinary working people. I have to admit, I was a little nervous. The NSS is an inspirational organisation, with a formidable reputation. Despite being outside the establishment, it moves among the higher echelons in the UK and the wider world. It’s officials make the case for secularism to the UK government, the European Parliament and even the United Nations, and make regular appearances on local and national radio and television. So to find myself in a relatively small (though very full) room with many of their leading lights, including the president, the executive director and the campaigns director, was daunting. Given the nature of their work, I shouldn’t have been surprised, but I was struck by how friendly, approachable and down-to-earth they all are. The lecture was very interesting, and well received by the enthusiastic audience. The speakers were Bob Forder, the NSS resident historian, who like me retains a fond affection for Manchester, where he lived and worked for a number of years; and Professor Bryan Niblett, author of ‘Dare to Stand Alone’ the biography of Charles Bradlaugh. 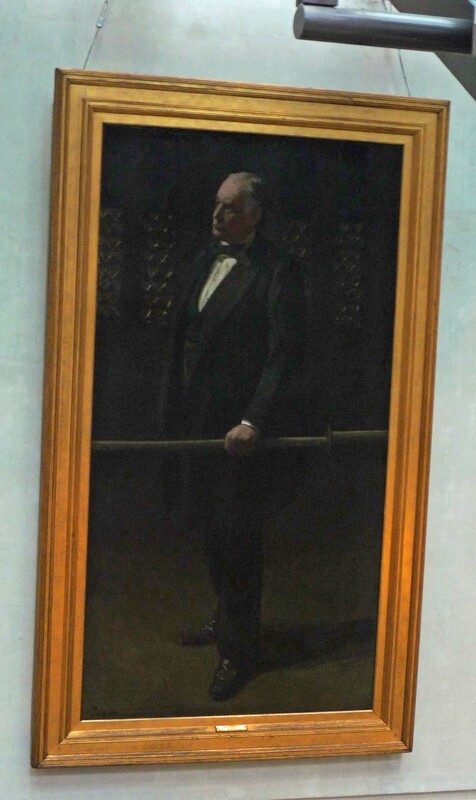 There were refreshments before and after, in the lobby of the gallery’s new extension, overlooked, in pride of place at the top of the staircase, by Walter Sickert’s large full length portrait of Charles Bradlaugh. 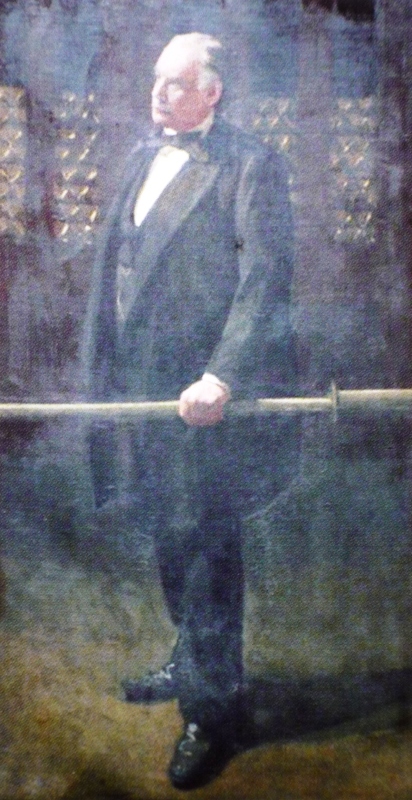 The painting has been in the gallery’s collection since 1911, but had been in storage for some years. It was cleaned and re-hung to coincide with the 150th anniversary of the NSS, and getting it up there was apparently such a difficult job that it won’t be coming down any time soon. Bob Forder set the scene for us, describing the repression of radical ideas in early nineteenth century Britain, partly a result of fears that the revolutions that took place on the continent might spread to Britain. He talked about Bradlaugh’s predecessors; people like Thomas Paine and John Stuart Mill, and the growth of radical ideas during Bradlaugh’s lifetime, particularly in the industrial powerhouse of Manchester, and in the labour movement. The NSS was formed in the same year as the Howard League and the Fawcett Society, but that unlike those, the NSS was primarily a working class organisation. Bryan Niblett went on to talk more specifically about Bradlaugh himself. Apparently he was a great orator, with a powerful voice. When he was elected to parliament (to represent Northampton) he asked to affirm rather than swear an oath (swearing an oath of allegiance to the crown with the words ‘so help me god’ was always going to be a difficult one for a republican and an atheist). When his request was refused, he actually did agreed to swear the oath, but wasn’t allowed on the basis that it wouldn’t be valid. By asking to affirm, he had let on that he didn’t value the oath. He was kept out of the house until the situation was resolved in 1886. He had to swear the oath to get in, but was instrumental in the 1888 Oaths Act, which gave all MPs the right to affirm, rather than swear a religious oath. Religious people often say that atheism is a negative (because it denies the existence of a deity without necessarily offering an alternative answer to the great question of life, the universe, and, erm… everything). Bradlaugh argued that theism is a negative, and that atheism is therefore a positive, because a negative of a negative is a positive. After the lecture, there was a Q & A session with the speakers, and the president and executive director. Some of the questions highlighted the confusion over the difference between atheism and secularism, something the panel were keen to clear up. 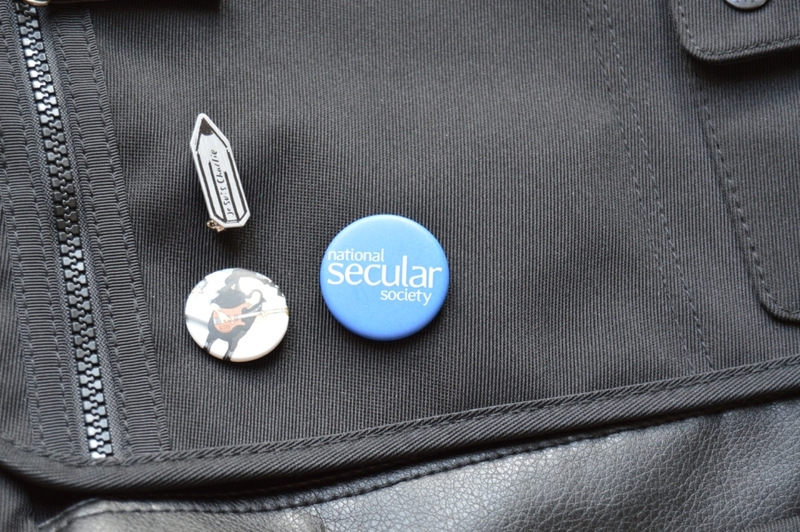 Though many of its members are atheists, the NSS is not an atheist organisation. It campaigns for freedom from religion, but also for freedom of religion. It wants to take away religious privilege (such as the right of bishops to sit, unelected, in the house of lords) but not freedom of belief. Some NSS members are religious- the president said he knows of at least one vicar who’s a member – and in fact the organisation sometimes campaigns alongside religious groups, where there’s a shared interest. Charles Bradlaugh may have been a little known figure up until now. But in addition to persuading the Manchester Art Gallery to display the Sickert painting, the NSS recently commissioned a bust of Bradlaugh, and this is now on permanent display in parliament. So perhaps at last Bradlaugh’s name will take its rightful place in history, among those who were so influential in fighting for the rights and freedoms that we can all enjoy in today’s Britain. This entry was posted in Manchester, Religion, reviews, Writing and tagged Atheism, Bradlaugh, Manchester, NSS, religion, Secularism. Bookmark the permalink.